Home » Moose's Camera Bag » The CT-3481 Rock Solid! So I’m going storm chasing again. I’m moving about the country in the navigators compartment in a TBM. And I have a bunch of other rides this year where there is barely enough space for me, let alone gear which includes a tripod. So I went shopping for a compact yet very stable travel tripod. 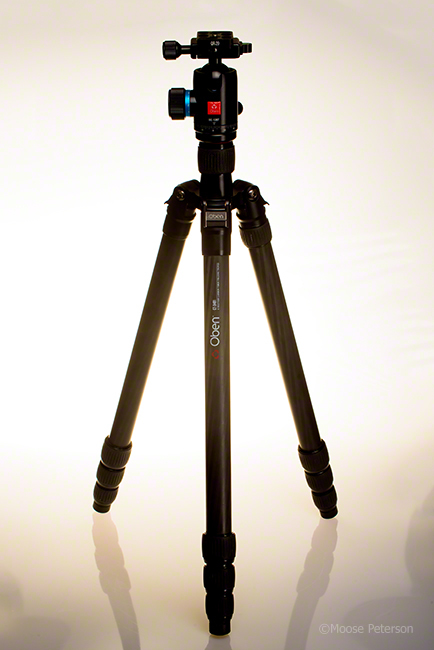 I found a gem, one I really love in the CT-3481 Carbon Fiber Tripod With BE-126T Ball Head. It weighs nothing and takes no space yet has a responsible height while providing support. It comes with the BE-126T head and a center column. It’s a nice head that is smooth and sturdy. You might notice in the photo though the center column is gone. There is a simple set screw that once loosened, the column comes off making the tripod 8oz lighter and that much more compact. It’s size, stability and price made it perfect for my needs. I love it when you can find the perfect match of gear for project!